Whether you’re moving down the road or across the world, we’ve got you covered. Johnson Storage & Moving has over 100 years of national and international moving experience. Together with our global network of partners, we can transport your belongings to over 200 countries around the world. Below are our office and warehouse locations, but you don’t have to be near one of them to take advantage of our services. Serving central and western Colorado, we have 78,000 sq. ft. of storage space, an autoloading ramp, and a truck scale. Our original location off Broadway serves central and western Colorado and has 22,000 sq. ft. of storage space. Serving Boulder County and northern Colorado, we have 40,000 sq. ft. of storage space, an auto loading ramp and a truck scale. Serving the San Diego metropolitan area and beyond, we are a port of call agency with 60,000 sq. ft. of storage space, an auto loading ramp and 2 certified scales. 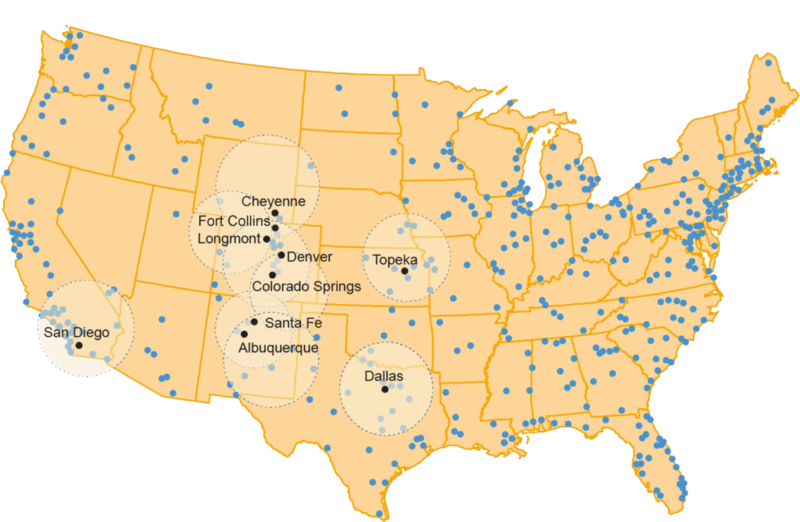 Serving the central U.S. and beyond, we have 70,000 sq. ft. of on-site storage space and a full-length public truck scale. Serving Albuquerque, we have 12,000 sq. ft. of storage space, and sell packing supplies. Serving Santa Fe, we have 18,000 sq. ft. of storage space, and sell packing supplies. Serving north-central Texas, Arlington, and Fort Worth areas, we have 250,000 sq. ft. of on-site storage space. Serving the Front Range urban corridor and beyond, we have 20,000 sq. ft. of storage space and full-length truck scale. Located at the base of Pikes Peak, Johnson Storage & Moving Co Colorado Springs offers a full range of professional moving and storage services for families and businesses.